In 1862, Confederate General John Hunt Morgan led his troops into Elizabethtown to capture the city, but more importantly disrupt the railroad. During the skirmish, over 100 cannonballs were fired into the city, and one became lodged into the side of the Depp Building on the town square. 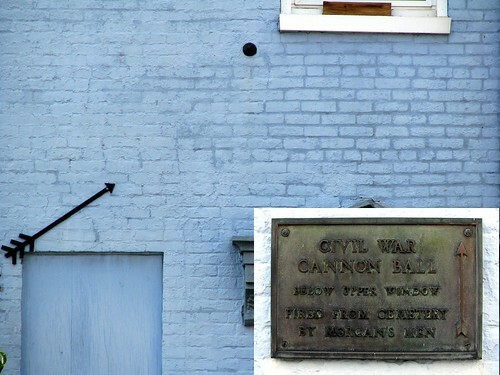 "...a fire destroyed that entire block and the cannonball fell with the wall. I...asked...the owners of the building to give me the ball, and they both kindly consented. I told the boys about it, that I would give 25 cents to the one who would find it and bring it to me. A lively scramble instantly ensued in the pile of hot bricks. I left them digging and went on home. In the afternoon a man brought it to me and demanded $5.00 for it. I told him it was already mine. After some hesitation he decided to leave it for 50 cents, which I gave him. Many years after...I restored it to the bank and they had it placed in the same spot as near as possible (in the new building), where it is seen today..."
Happy 270th Birthday to James Robertson! Born in Brunswick County, Virginia, June 28, 1742. Moved to North Carolina in 1750. Came to Tennessee in 1769. Died in Tennessee Sept 1, 1814. Reinterred inthe City Cemetery at Nashville, 1825 under authority of the Tennessee Legislature. 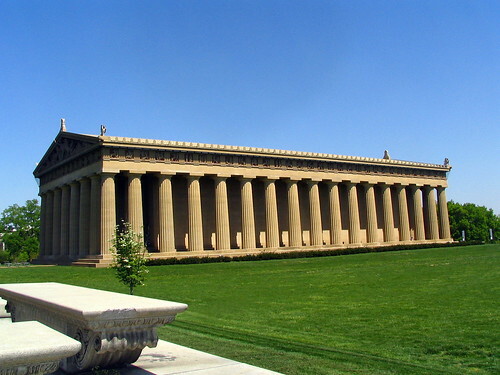 Here is a view of what is perhaps Nashville's most famous landmark. 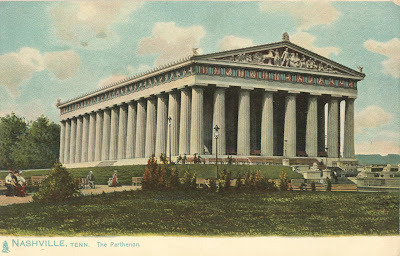 This post card was dated 1911. Here's a modern view of the front. Normally, for the blog I stick to places in Middle Tennesse, or at most a half day's drive from Nashville. I'm making an exception today for something I saw a couple of months ago while on a trip to the Florida Panhandle, for a place that made the news a few days ago. Gator Lake is a small lake inside St. Andrews State Park at Panama City Beach, Fl. 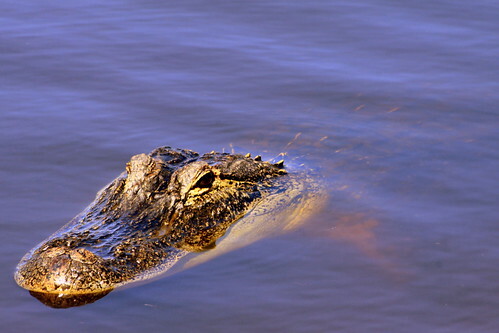 About a half dozen gators live there year round, and more show up in the spring when the water gets nice. This is the first time I'd seen an aligator "in the wild" and not in a zoo. I use the term "in the wild" loosely as these wild animals see humans all the time. At the time of this picture, there was nothing between me and this gator except a wooden fence that the gator could probably crawl under. 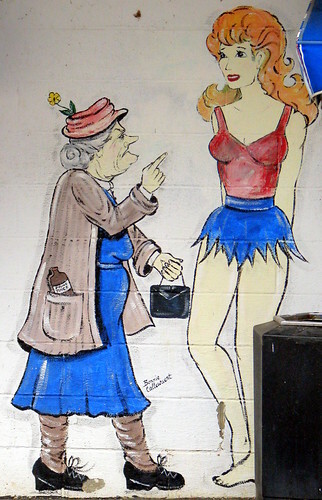 The Old lady does not approve on the young lady's immodest clothing. The old lady also has a bottle of prune juice in her coat pocket. 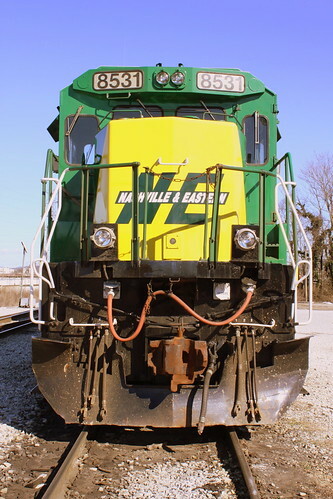 Nashville & Eastern Rilroad is a short line railroad which was formed in 1980 to run east from Nashville to Lebanon, Watertown, Cookeville and Monterrey. 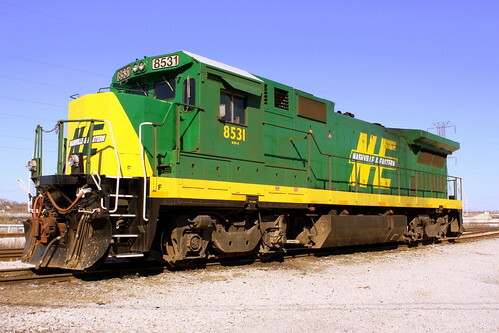 They operate on track which used to belong to Tennessee Central, so they work with TC to operate their railway museum excursion trains, as well as park their equipment at the old TC rail yard. In addition to the Green & Yellow, they also have an Orange & Yellow design for some of their train cars. When You See Rock City You See the Best. This is indeed a Rock City barn, although if you didn't know what the rest of the message said, you wouldn't realize it. The colors above the newer overhand have faded, and underneath it so dark under there that you can't see any of the words when driving by. 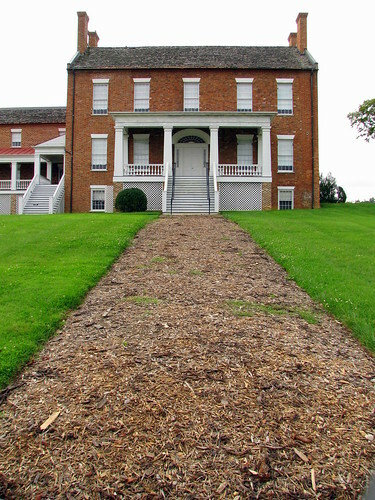 Designed and constructed (1815-21) by Irish craftsmen Thomas Battersby and John Hoy, this house was built by Greeneville's first postmaster, William Dickson, for his daughter, Catharine (Mrs. Alexander Williams). Marquis de LaFayette, Presidents Jackson and Polk, Henry Clay, David Crockett, and Frances Hodgsen Burnett were visitors. 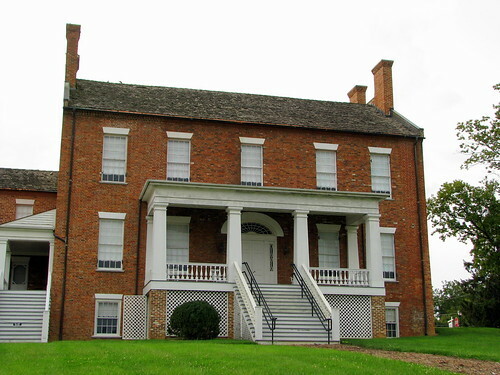 It served as headquarters for both Confederate and Union officers. Confederate General John Hunt Morgan spent his last night here before being killed in the garden on September 4, 1864. This is on the National Register of Historic Places as part of the Greeneville Historic District. 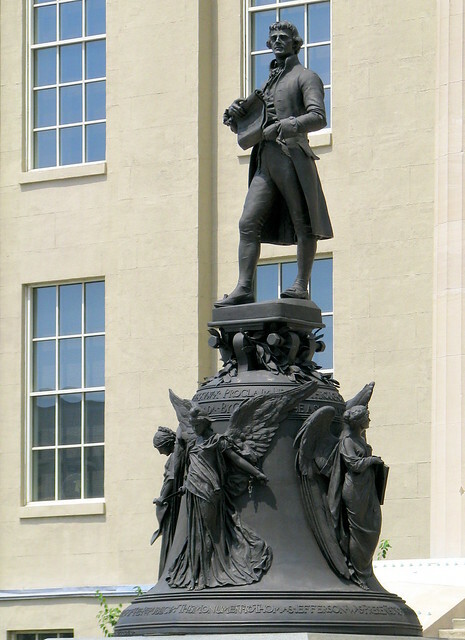 In front of the Jefferon County Courthouse (now known as Louisville Metro Hall) in Downtown Louisville, KY is this prominent statue of Thomas Jefferson. 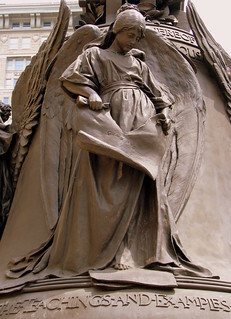 It was sculpted by Moses Ezekiel in 1901 and given to the city. 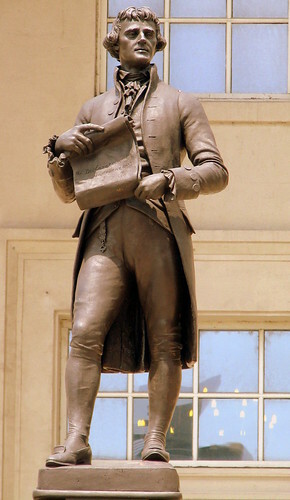 For the statue, Thomas Jefferson is holding the Declaration of Independence, which he authored. 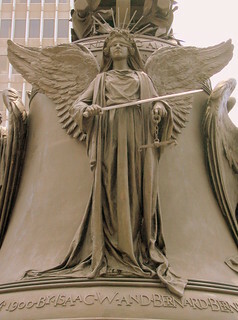 Jefferson stands atop a bell. 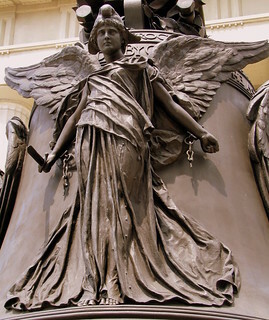 The bell is flanked by four winged statues representing Equality, Justice and the Brotherhood of Man (Religious Freedom), and Liberty. This Monument was unveiled on Nov. 9, 1901. 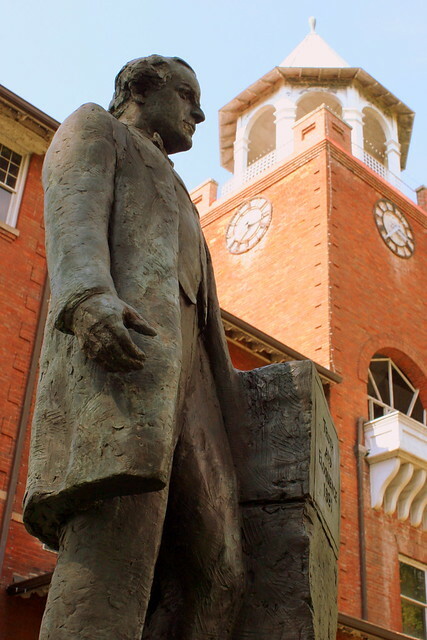 A smaller replica of this statue is also displayed at the University of Virginia, which was Founded by Jefferson. 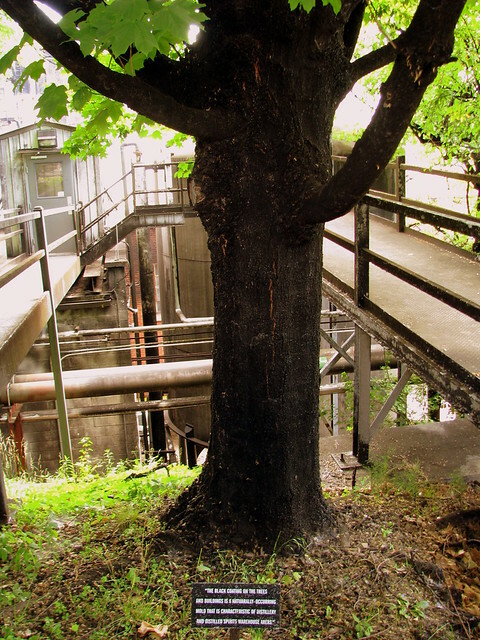 According to the marker at the base of the tree, there is a special kind of mold that grows near a distillery that forms on the exterior of the trees to make it black. Souvenir, Texas-Tennessee Hall of Heroes. Miss Christine Lamb, pictured with the Solemn Ole Judge of WSM, Nashville's 50,000 watt Station - Air Castle of the South. 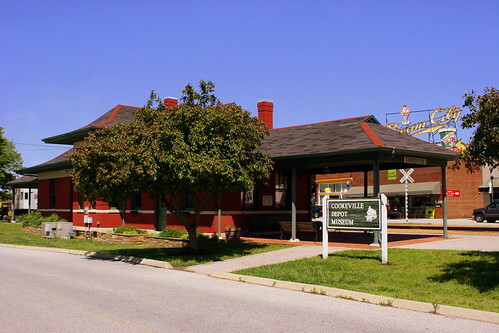 This depot was built in 1909 by Tennessee Central to replace an earlier depot in the middle of the Cream City district. TC only built three depots out of brick, and this was their "Jewel" with its notable pagoda style roof. Passenger service lasted until 1955 and TC used the building until they went out of business in 1968. 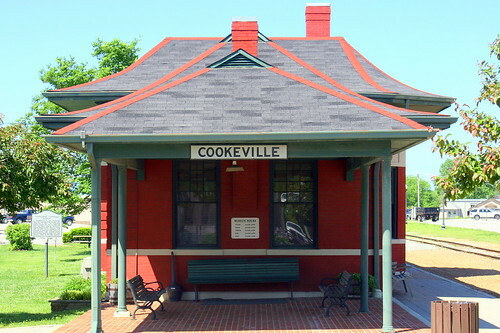 Like most unused depots, it started to fall into disrepair until the Friends of the Depot and the City of Cookeville purchased it in 1975. 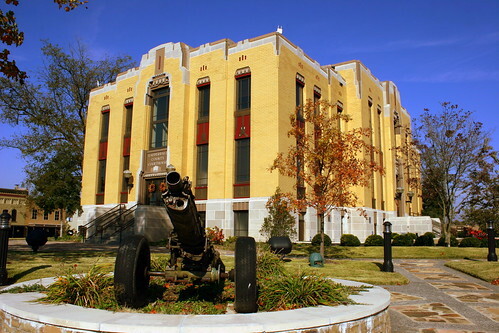 In 1985, the depot was added to the National Register of Historic Places and also opened as a museum. 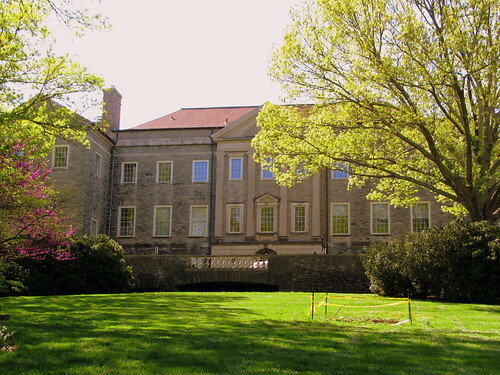 Part of the Cheekwood Botanical Gardens in the Bellevue section of Nashville, TN. This mansion was owned by the Cheek family, famous for the coffee blend served in the Maxwell House Hotel in downtown Nashville, which President Teddy Roosevelt proclaimed was "Good to the Last Drop." 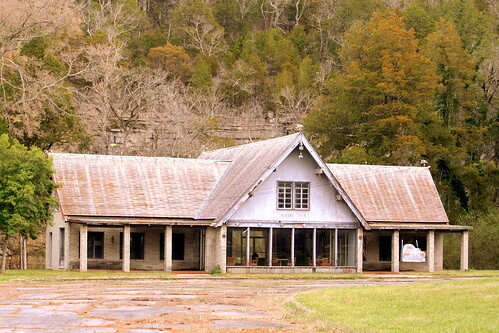 It was built in 1929 and is now on the National Register of Historic Places. The family lived here until the 50's when it was given to the city with the Mansion used as an art museum and the grounds became a botanical garden. The sandstone rock atop this lighthouse-shaped pedestal is the only known remaining fragment of the 16 ft. dog shaped monolith that stood for centuries about a half mile west of here. Nobody knows exactly how many centuries ago Indians placed the stone, which likely marked an area of peace for those who traveled and hunted along the Cumberland Plateau. Over the years, weather and souvenir seekers who would carve off a tiny piece of it almost entirely dimished the stone to a height of 3 1/2 feet. Local travelers used the remnant as a hitching post until the railroad came through and blasted it to smooth out a railroad bed. Of that, the largest remaining peice was placed atop the pedestal in a ceremony in Oct. 1895. 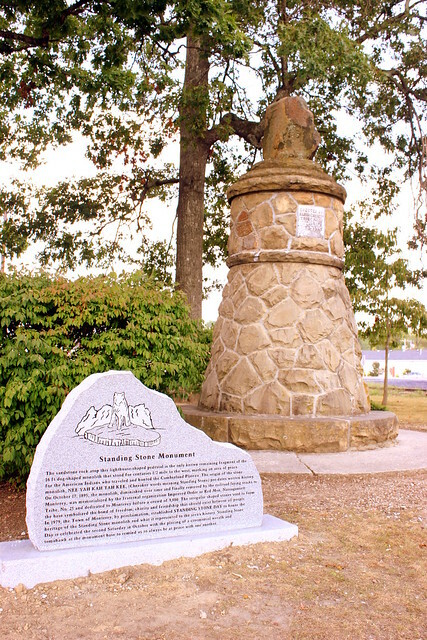 Since 1979, the town has celebrated Standing Stone Day each year on the 2nd Saturday in October. A highlight of the festival is when a wreath and tomahawk are placed at the base. Located in front of the Rhea County Courthouse, where many decades earlier, just before his death, the former Democratic Presidential Nominee orated and argued for the prosecution in the Scopes Monkey Trial. In case you were wondering, there's no such love for Clarence Darrow in Dayton. 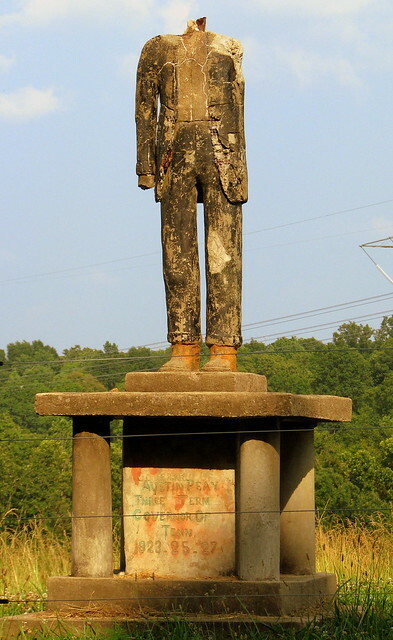 The Statue was placed here in 2005 by Bryan College for their 75th anniversary, honoring their namesake. Sculptor Cessna Decosimo added a couple of touches to this statue. 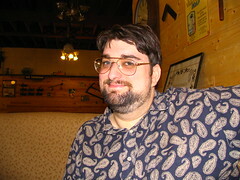 For instance, Bryan's right hand is ready to greet people while his left hand is resting on a lectern. 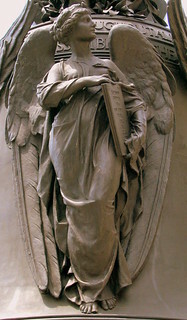 Inscribed on the front of the lectern is "Truth and Eloquence 1891." 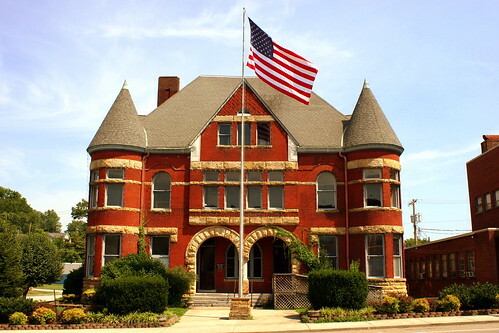 1891 was the year Bryan was first in congress and the courthouse was built. In 1801, the U.S. Government directed the Army to make improvements along the Natchez Trace. By that time, travelers between Nashville and Natchez were utilizing the Trace more and more, and the primitive state of the roadway made each journey a harrowing experience. The army did not complete improvements to the full length of the Trace but did make significant improvements in Middle Tennessee. For most of the improved area, there was eight feet width of smoothed ground for the benefit of horse and foot traffic with an additional eight feet of cleared trees and underbrush. Bridges were built across streams to eliminate the inconvenience of crossing fords. 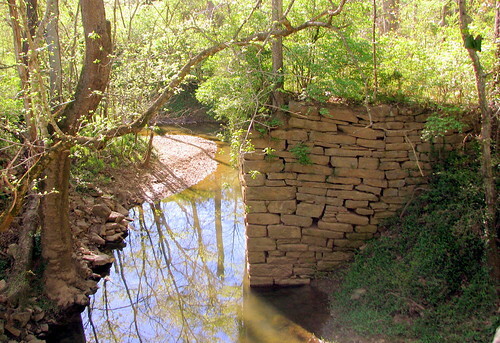 One such bridge was in Williamson County at the crossing of a tributary of the Harpeth River called Brown's Creek (or at the time, known as Donelson's Creek). Browns Creek seen here at one time was a boundary of a prehistoric Indian village in an area today known as Old Town. This is a real photo postcard, and is many decades old (may be dated 1944). This building is in better condition today than it was when the post card was made. Back then the town cut the UGH off the end of the town's name and went as Jonesboro. More recently, in an effort to attract tourists based on the town's old heritage, they put the UGH back to restore the name to Jonesborough. When this card was made, the Inn was owned by a florist, and if you look closely, you can see the neon sign at the end. One thing that hasn't changed between then and now is there is always cars parked in front of the building. 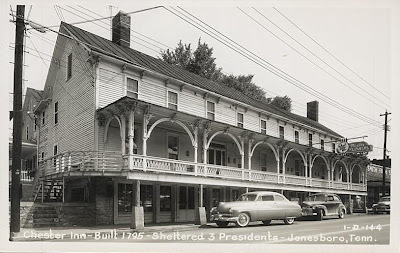 Dr. William P. Chester, a native of York County Pennsylvania and an excellent Jonesborough physician, opened the Chester Inn in 1797 on the Great Stage Road. As a physician in a small frontier town, he found it necessary to supplement his income. The Inn is the oldest wooden frame building in the commercial district. The original structure is of the Federal style. The Victorian front porch was added in 1880 and is an example of the elaborate work of the craftsmen of the period. The Inn was known as the finest inn on the Tennessee frontier and played host to three United States presidents-Andrew Jackson, James K. Polk, and Andrew Johnson. 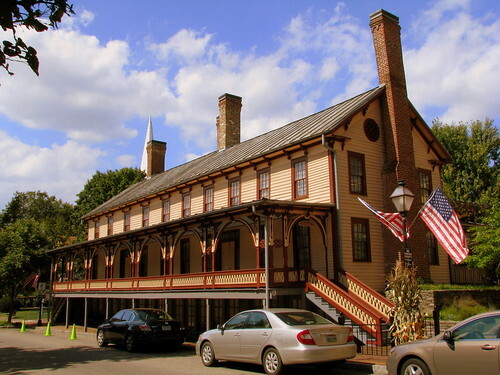 In the early 90s, the inn was purchased by Tennessee to restore the building back to its Victorian era glory. 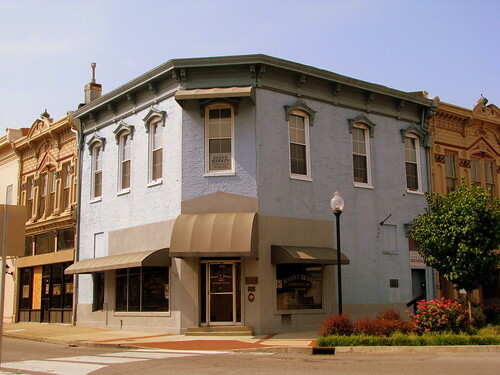 It is listed on the National register of Historic Places as part of the Jonesborough Historic District. It is also used during the International Storytelling Festival, whose headquarters is listed next door. At the Age of 18, Polly Finlay married Davy Crockett in Jefferson, TN. 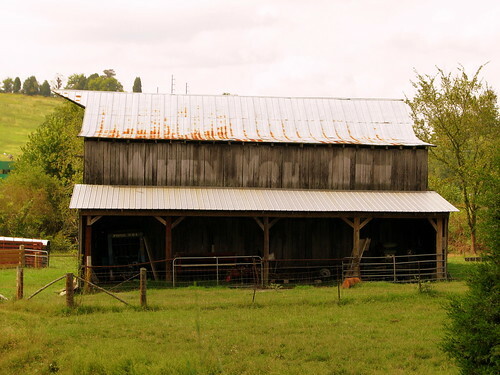 5 years later in 1811, the family moved to Franklin County, TN on some land overlooking Beans Creek. Polly was the mother of 3 of Davy's children, raising them at their house on this land at a time when Davy was off volunteering for Andrew Jackson's army. On this day, June 11, 1815, Mrs. Crockett died and was buried at a small cemetery on the property. Eventually Davy married again and the second wife Elizabeth lived many years after Davy's death at the Alamo. 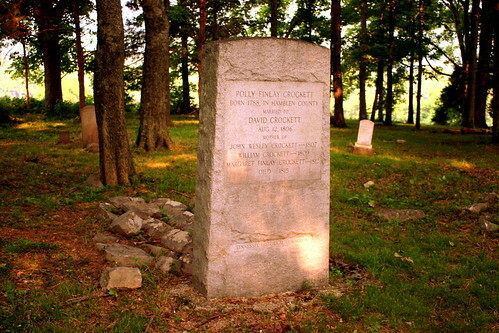 Most of Davy Crockett's storied achievements that helped bring him fame happened after Polly's death. When the second wife died, her gravesite was adorned as the wife of a famous hero, complete with a marble headstone and a statue. By comparison, Polly was buried in a location that time almost forgot. Eventually, (in the early 80s I think) the Tennessee Historical Commission erected the larger marker seen here as well as a roadside historical marker where US64 passes a couple of miles away. It's my understanding that this is still on private property, but the owners are nice enough to allow those that are aware of it to visit. At the same time, Franklin County's tourism people are trying to make this place more well known and hope to turn it into a small park. Along the Old Dixie Highway (TN2) in Marion County, TN. Not only does the building look old, but the sign proclaiming the name of the church was old and nearly impossible to read. The highway parallels Interstate 24 through here and you can see this building from the interstate. 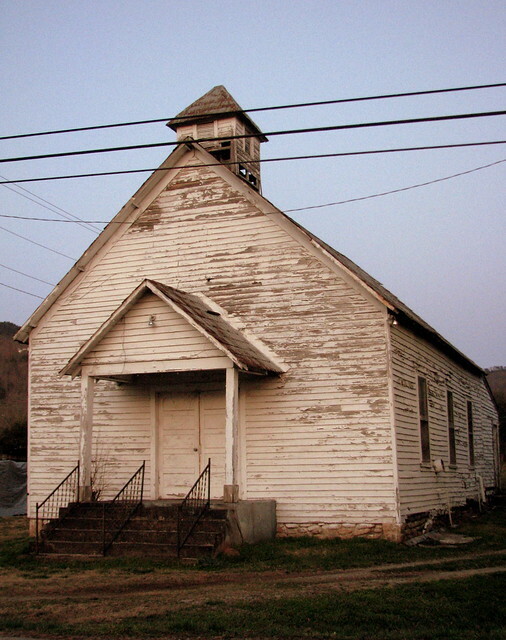 The building was built in 1904 and at the time it was Ebenezer Baptist Church. 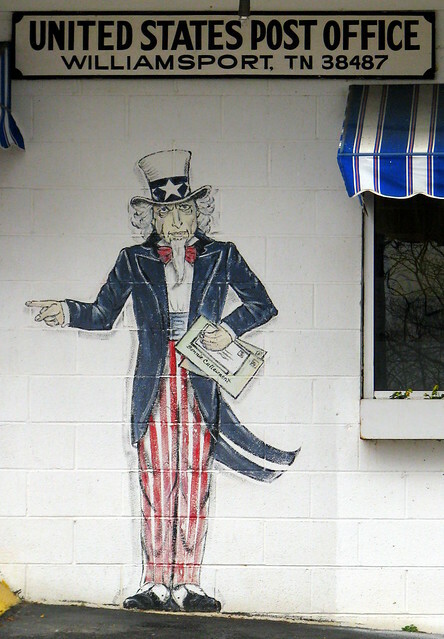 For almost 50 years, visitors have made it a "point" to see Wytheville's Main Street landmark. 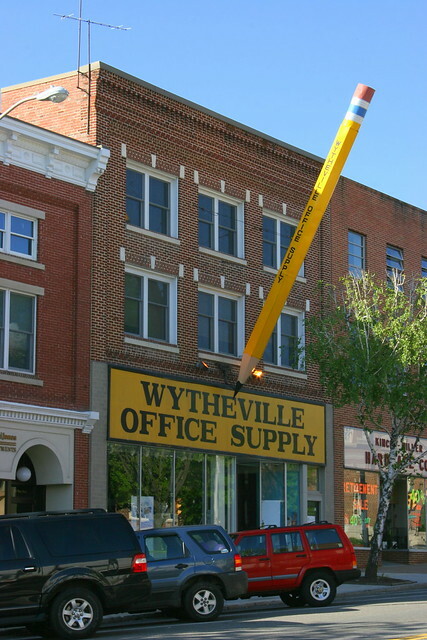 The late John Campbell Findlay (the original owner of Wytheville Office Supply) had the "Big Pencil" constructed in the early 60's. Made of metal, it is approximately 30 feet long. Over the years it has had a number of facelifts to keep it in pristine condition. Recently, in the Washington Post the syndicated comic strip "Zippy" by Bill Griffith, featured the "Big Pencil". Wytheville, VA is the county seat of Wythe County and US 11 is the main road through town. This store is right in the middle of town. The cave is located near the base of Cumberland Plateau in Grundy County. Back in the days of the Dixie Highway and later highway US41, the turn to get to the cave was located at the last turn before making the ascent to Monteagle. Everyone travelling from Nashville to Chattanooga would have passed nearby, about a mile from here. As has been the case with many "impulse" tourist attractions, the opening of the interstate killed off this business. Now people take I-24 through the area and the Cave soon went out of business. It reopened again but soon closed again circa 2000. Even though it's not open commercially these days, I hear it's possible to get in the cave if you do a little research, not that I'm advocating you hop the fence I'm standing behind right here. Built in 1882, this is the oldest covered bridge in Tennessee. Constructed at a cost of $3,000 by contractor Dr. E.E. Hunter, George Lindamood and three carpenters, it spans the Doe River for 134 feet, resting on earth and limestone abutments. Hunter hired Colonel Thomas Matson, who had engineered the narrow guage Tweetsie Railroad, to design the bridge and serve as construction chief. Hunter made a profit of $5 on the bridge, so one of its names is the "Five Dollar Bridge"
The original structure was made almost entirely of wood; mainly mountain oak and white pine beams that were hauled down the steep slopes of the mountains by draft horses and mules, weatherboard of mountain poplar, and shingles cleaved by mallet and fro from chestnut. Hand forged steel spikes and hand threaded bolts fastened together the massive pieces of oak flooring. 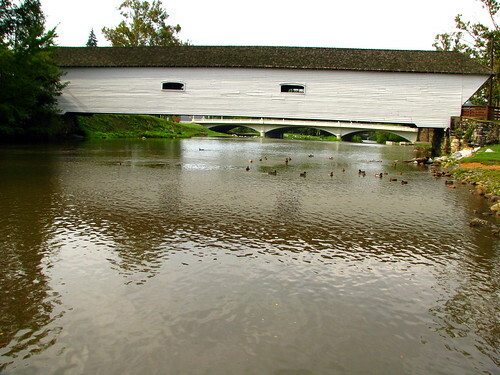 Termed an engineering feat, and listed in the Historic Engineering Record, the Covered Bridge survived numerous floods, including the great May flood of 1901, which destroyed all the other bridges in the county that crossed the Doe River. 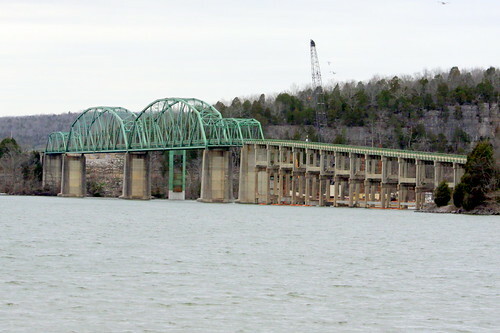 It is one of two bridges in Tennessee identified by a Tennessee Historical marker and is included on the National Registry of Historic Sites. The Covered Bridge remains the most photographed and most admired historical structure in Carter County. The bridge contains one span and is of Howe Truss design. Inside the bridge is one lane of vehicle traffic, plus a pedestrian walkway, although the bridge is now closed to motor vehicles. Each end of the bridge features a projecting truncated gabled roofline. This is a real photo postcard that has been dated 1936 at the bottom. The labels at the bottom read: Hales Bar Power Plant, Tennessee Valley, Dixie Highway - U.S. 41. Now, on to what today remains of Hales Bar Dam. 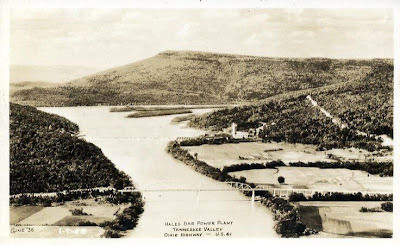 Hales Bar Dam was a hydroelectric dam located on the Tennessee River in Marion County near Halestown (aka Guild). 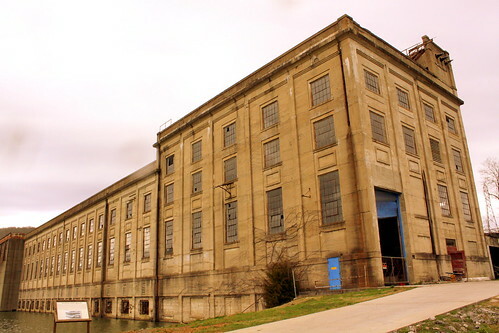 The Chattanooga and Tennessee River Power Company (TEPCO) began building the dam in 1905 and completed it in 1913, making this dam one of the first multipurpose dams and one of the first major dams to be built across a navigable channel in the U.S. 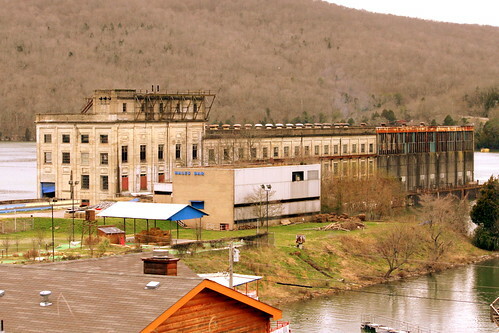 In 1939, TVA assumed control of the dam after purchasing TEPCO's assets. TVA then spent two decades trying to fix a leakage problem that had plagued the dam since it's construction. 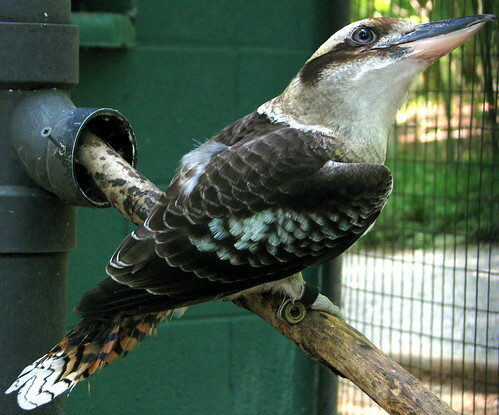 After continued leakage, it was determined that expanding the dam's navigation lock would be too expensive. TVA decided to replace this dam by constructing Nickajack Dam 6 miles downstream in 1968. Today, what's left just looks like it protrudes out into the river while serving no purpose. 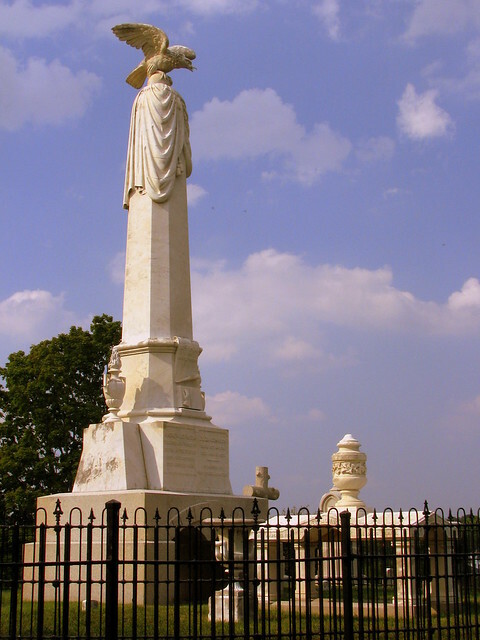 President Andrew Johnson is buried at the top of the hill at the place now known as Andrew Johnson National Cemetery. It is under the oversight of the National Park Servce as part of the Andrew Johnson National Historic Site in Greeneville, TN. Johnson purchased 23 acres around "Signal Hil"l in 1852 because he liked the view. Johnson died in 1875 and was buried here. 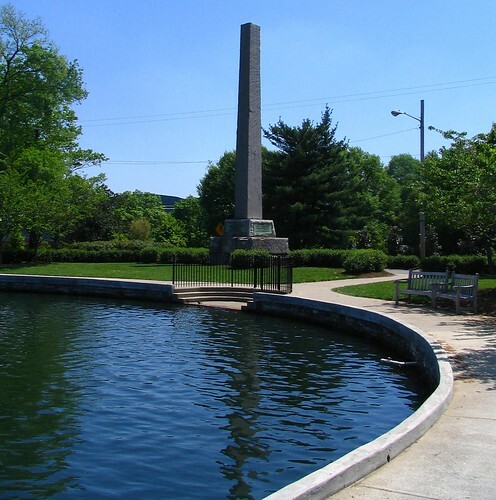 In 1878, it became "Monument Hill" as the 28-foot marble obelisk was placed here. Other family members were buried here atop the hill. Johnsons daughter suggested that it should be a National Cemetery as soldiers from many wars are also buried here. This congregation was founded in 1780 under the trees of Greeneville's Bug Spring by Samuel Doak. Originally called Mount Bethel Presbyterian Church and then Harmony Church. This building dates from 1848 and was restored after a disastrous fire in 1928. 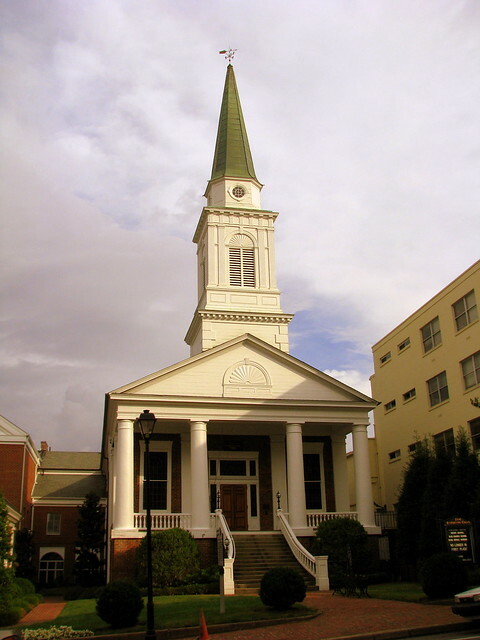 This church is on the National Register of Historic Districts as part of the Greeneville Historic District. 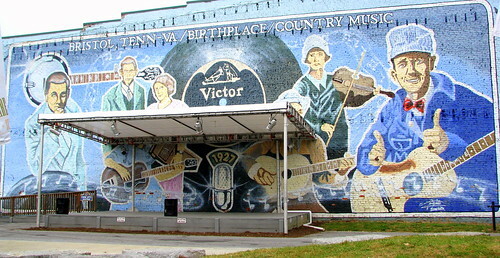 It is located along Main St. (US321, Old US 11E"
In 1927, Ralph Peer of Victor traveled to Bristol to record some of the local mountain music on the advice of Ernest "Pop" Stoneman. During these sessions 76 songs from 19 artists were recorded, including The Carter Family, Jimmie Rodgers and the Stoneman Family. 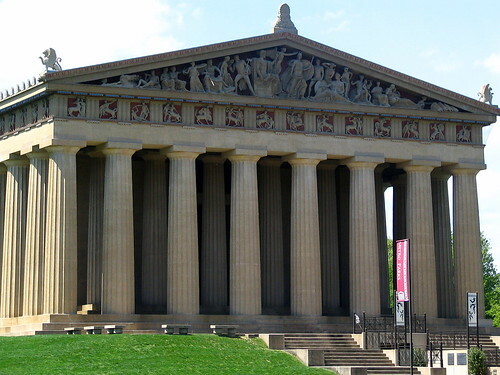 In 1998, the U.S. Congress recognized Bristol as the Birthplace of Country Music, Soon a birthplace of Country Music Mueseum will open in Bristol. 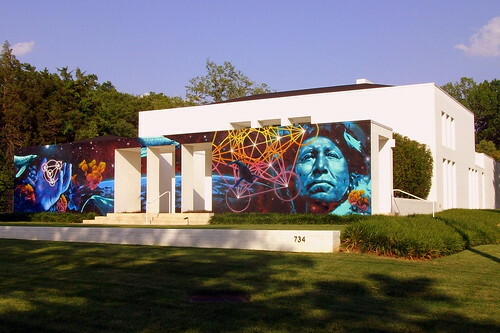 This mural was painted in 1987 by local artist and musician Tim White. from left to right is Ralph Peer, the Carter Family, the Stoneman Family and Jimmie Rodgers who is giving his double thumbs up pose. 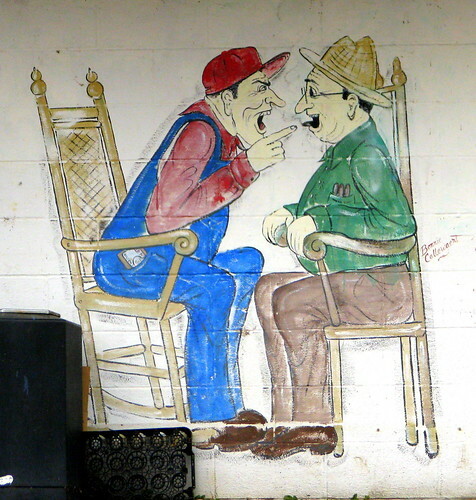 The mural serves as a backdrop for a stage making for a popular music venue in town.